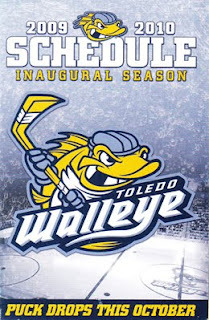 Today in the mail I received a package from the Toldeo Walleye hockey club of the ECHL. 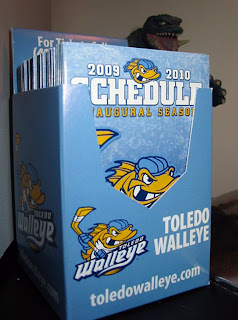 They were kind enough to send me a Walleye schedule holder full of pocket schedules. Not only is this a great addition to my sked holder collection, but it is official the first 2009/2010 hockey schedule I have received this season. I love collecting pocket schedules - they are my version of hockey cards! I try to collect a full set of schedules from each team in each major and minor hockey league. Last season (2008/09) I managed to get about 90% of the pocket schedules on my list, but there are still a few that I am missing; Houston Aeros, Augusta Lynxx. Rapid City Rush, Wichita Thunder, Erie Otters, Peterborough Petes, Sault Ste. Marie Greyhounds, Brandon Wheatkings, Moose Jaw Warriors, Regina Pats, Swift Current Broncos, Cedar Repids Rough Riders, Fargo Force, Albert Lea Thundes, Alexandria Blizzard, Mahoning Valley Phantoms, Owatonna Express, Springfield Blues, Topeka Road Runners, Merritt Centennials, Penticton Vees, Powell River Kings, Westside Warriors. If you can help me with any of my wants, please contact me!